It is the last month of summer, but many of us still could not get adapted to hot weather and long days. On this background, nutritionists suggest healthy nutrition as the most effective tool for feeling good in summer. Follow these 7 easy rules for feeling healthy and refreshed even when it is 40 degrees Celsius outside. Rule No. 1: Do not overeat. Overeating makes our body spend more energy to digest the meals, instead of spending it for other important processes. Besides, overeating increases the risks of having extra weight, that is why it is always better to rise from the table with a light feeling of hunger. Rule No. 2: Avoid fast food, as well as fried, fatty and other heavy meals. For feeling good in summer, it is essential to eat a light and balanced diet. Thus, the foods you eat should include 14-15% of proteins (fish, dairy products, poultry, etc. ), 10-11% of fats (preferably vegetable fat) and good amounts of complex carbohydrates enriched with minerals, vitamins and other useful elements (vegetables, cereals, pasta, bread, etc.). Rule No. 3: Drink sufficient amounts of water. In summer, our body needs up to 2 times more water than it usually needs in winter. It is especially important for those people who do a lot of physical exercises and physical activities. Our average daily norm of water intake is between 2,5 – 3,5 liters, or about 30 ml of water per kg of our weight. However, do not forget that we receive water from fruit and vegetables we eat and avoid overdrinking – it causes swelling and unpleasant heaviness in the body. Rule No. 4: In summer, eat 5 times a day. Make a habit of having two snacks between your usual breakfast, lunch and dinner. Choose fruit and diary products as those are very light, nourishing and useful types of foods, which will not overload your digestive system. Rule No. 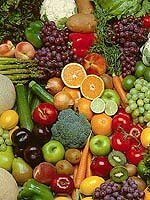 5: One day a week, eat only fresh fruit and vegetables. It will be like a day off for your body. Choose a day when you do not need to collect and spend a lot of energy (possibly, in the week-end, when you are lazing all day long). Listen to the reactions of your body and do not let yourself impair your body functions. Rule No. 6: In summer, avoid drinking alcohol. Alcoholic drinks usually cause dehydration which is quite dangerous in hot weather. Also, drinking alcohol can stimulate sweating that can be also an extra load on your body in summer. If you really want to please yourself with a glass of good wine, do not go over 200-250 ml. Rule No. 7: Eat only fresh foods. This rule is very important for feeling good insummer as in hot weather the meals we eat can get broken much faster than in winter. That is why everyone of us should be very careful. Whan you buy something to eat in a market or tore, always pay attention to the expiry date of the product. Finally, do not forget to observe the rules of personal hygiene. Wishing you healthy and happy summer! This entry was posted 9 years, 8 months ago.